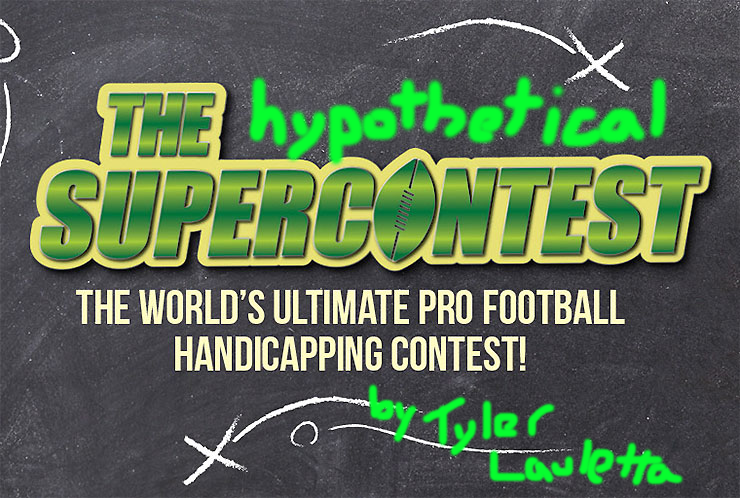 Another season of professional football has arrived and with it, another year of the The Hypothetical SuperContest. Oh man, it feels good to be back. 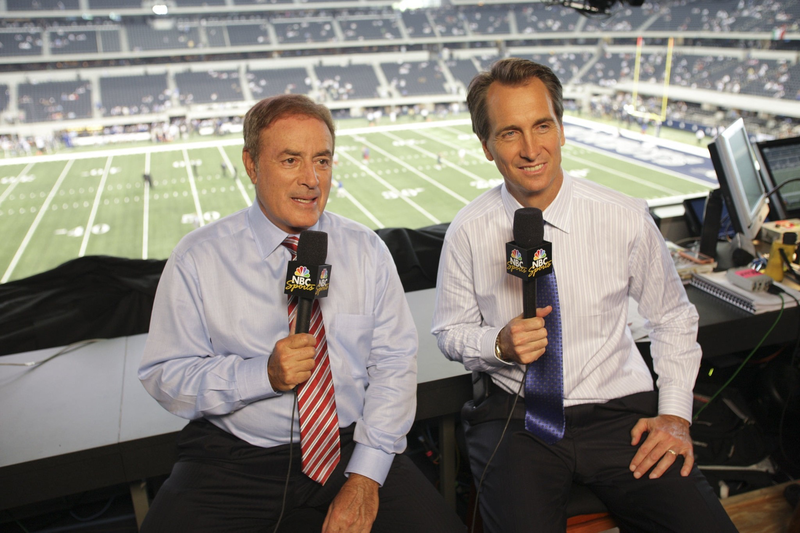 Last night, the Patriots and Steelers rang in the gambling new year, with Pittsburgh completing an unbelievable backdoor push that did not go unnoticed by the great Al Michaels. What a great question to start with! 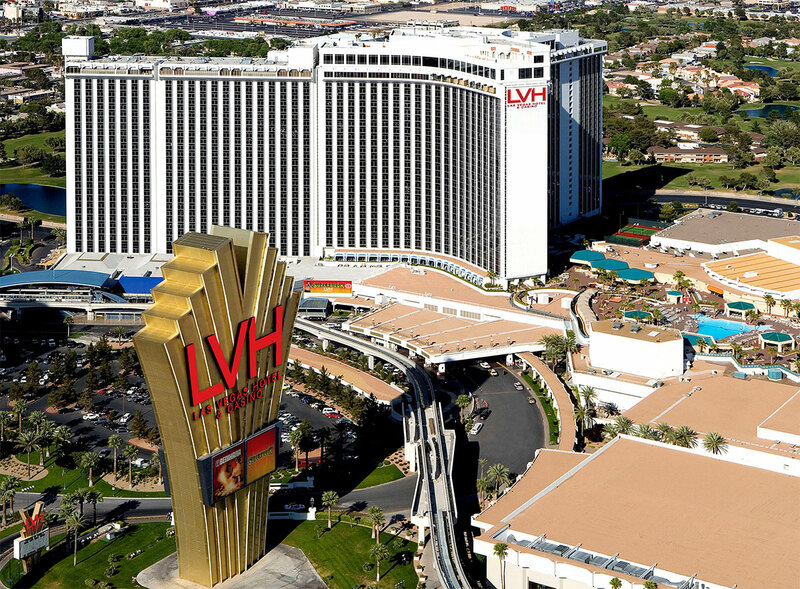 Every year, the LVH Hotel and Casino hosts the SuperContest, advertising it as “The World’s Ultimate Pro Football Handicapping Contest.” The LVH publishes spreads for each week’s football games. Contestants then pick their best five bets each week. Those who post the best records in their picks against the spread over the course of the season win a share of the prize pool (last year the winner took home $736,575). What makes this particular SuperContest “hypothetical”? In order to enter the actual SuperContest, you have to pay $1,500, which is approximately $2,000 more than I have to spare at this particular juncture of my life. 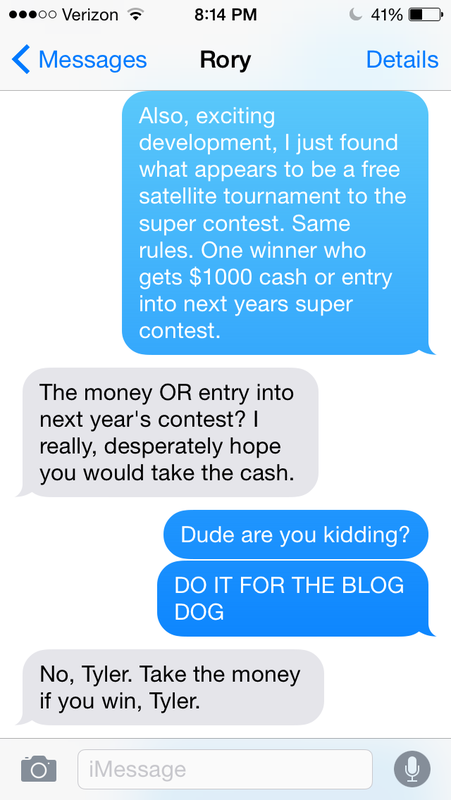 So instead of actually entering the SuperContest, I write a blog about it, in which I pretend to be a part of the competition and track the results of my picks. So this is all pretend? You can’t make any money. Why do you do this? I am that special kind of idiot. Why should I trust your opinion on gambling on football? Totally valid question. Last year I finished a disappointing 40-45 ATS, but in 2013 I picked my way to a record of 46-37-2, which is pretty good. So I have proven in the past that I am not completely awful at this. Just saying. With that said, you can totally not trust my opinion on football. I get it. I hardly trust myself half the time. And I rely a lot on .gifs to select my teams. Fair enough. Do you have any specific goals for this project? Sort of. The dream is to pick so well that I would have been in the money of the actual SuperContest, where the top 30 get paid. But the main goal is to make pretty good picks and entertain you. I try to go at least 3-2 every week, maybe have some 5-0 magic sprinkled in there, and pray to the gambling gods that I avoid the 0-5 week. But this is really just about fun and giving me an excuse to keep track of my picks. Cool idea man. I am really going to enjoy reading your Hypothetical SuperContest column this year. Thanks man! I like to think that you will too. Alrighty then! Now that we’re all on the same page, let’s get hypothetical! Here are the Week 1 lines as listed by the SuperContest. Home team gets the asterisk. 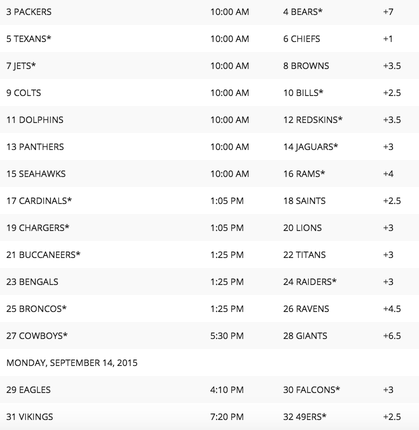 So this is a list of the “spreads” of each game this week, as set by the LVH SuperContest. For the uninitiated, the spread is a nifty tool invented by God so that degenerates like me could gamble on every football game under the sun. We can use last night’s Patriots-Steelers game as an explanatory tool. Going into the game last night, the dominating storyline was that Tom Brady and Bill Belichick were in full EFF-YOU mode after the #deflategate debacle. Meanwhile, the Steelers were missing fantasy God Le’Veon Bell to suspension and were sporting a defense most thought to be shaky at best. Over the course of this column, I have been in love with multiple professional football players. While RUSSELL HUSTLE BUSTLE WILSON has long held my romantic attention on Sundays, he was joined last year by the likes of JJ Watt, Sammy Watkins and Zach Mettenberger’s facial hair. 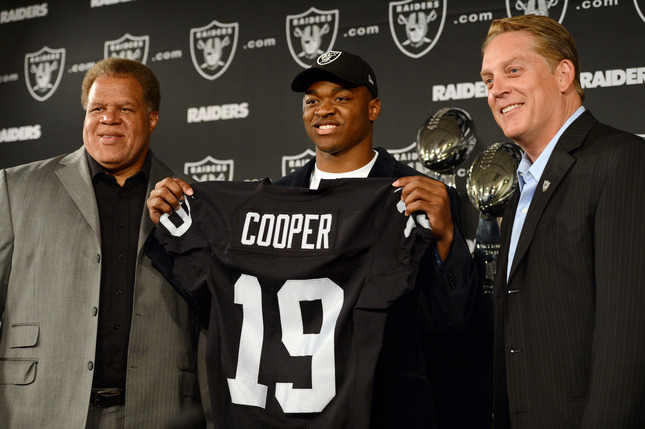 This year, my initial adoration is aimed at Amari Cooper. I seem to make this mistake every year, but I like the Raiders a lot right now. Derek Carr is a gunslinger, which I like, even if he’s not a very good one. And Amari Cooper is truth. Add Michael Crabtree and Khalil Mack, who got a 91 rating in Madden this year (! ), and I’m ready to paint my face silver and black. Each week, the CBSSports Experts make their picks against the spread. I have always had a problem with these men being marketed as “experts,” seeing as last year only two of seven had a winning record on their picks against the spread, but I’m guessing that the distinction of “expert” is one bestowed by CBS as opposed to self-anointed. Anyway, surveying the picks of these “experts” last year, I found an odd trend that I found a bit funny: Whenever the “experts” were unanimously on a side, that side would always lose. Although this trend evened out a little bit last year, it still holds true for Week 1. Over the past two years, the CBSSports “experts” have stood united on six games and won none of them. This year, they are unanimous on three. Now, I don’t feel great about these picks. I’m pretty confident that Washington will be the worst team in the NFL and I think the Dolphins are pretty good, so only getting +3.5 there feels gross. Also, professional bettors have been all over the Chargers this week, so that one is a bit nauseating as well. And dear God why would anybody bet against Aaron Rodgers ever? But this is a system that has paid off for me in the past, and thus I am hesitant to question it. Bring it on experts. I don’t believe in you at all. Here’s to keeping streaks alive. This is a sucker bet. It absolutely REEKS of sucker bet. Public bettors are all over the Eagles, while professional bettors are putting big money on the Falcons. There are reasons to like Atlanta here: The Falcons have won seven straight home openers and Matt Ryan is 39-15 for his career in the comforts of the Georgia Dome. But I like the Eagles this year. A lot. Maybe it’s my homerism, but I think Philly has a chance to be one of the top three teams in the league, and simply put, top three teams don’t lose to the Falcons. The debate is still ongoing, but I feel very strongly that if I am blessed with a season of picks good enough to win this contest, I’ll take my chances and enter the real SuperContest next year. Hopefully, next year this column will not be hypothetical. Last year, I spent a few weeks allowing random chance to dictate my picks. I threw darts, or played quarters, or flipped coins and let fate bring me glory or shame. This year, instead of using randomness to determine my picks a few times, I will actively compete against them. The plan: Each week I will make my picks based on past performance, line movement and whatever mood I am in at the time. 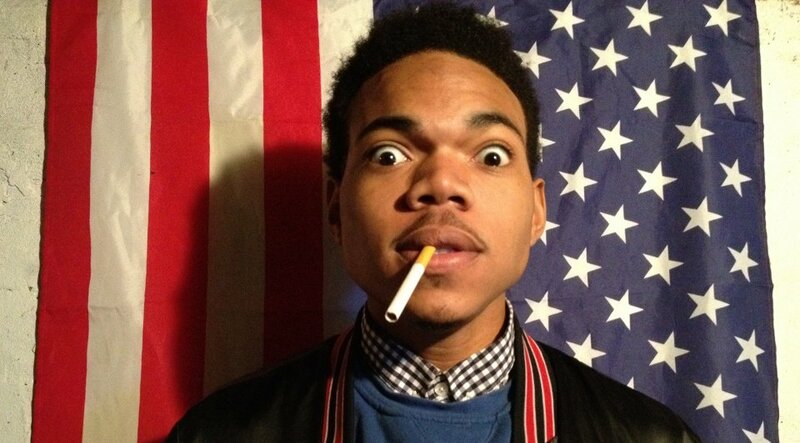 After that, “Chance the Gambler” will make his picks based on random chance. At the end of the year, I will either have proof that the effort I put into studying football is worthwhile or evidence that none of us know anything, and if you’re going to bet on football, it’s probably best to flip a coin and go from there. The presence of Chance the Gambler also gives me an excuse to embed a Chance song once a column, which is one of my favorite things to do. This week I kept it simple. 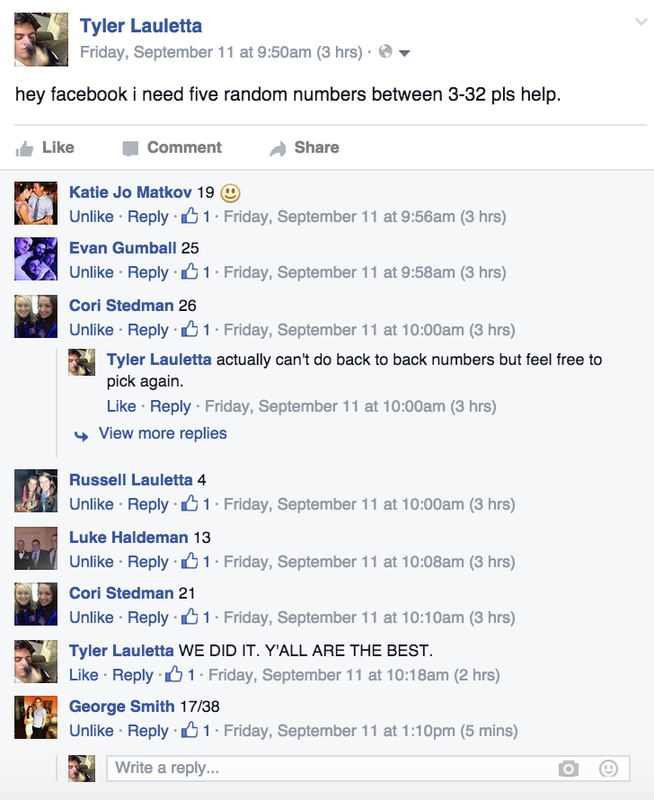 Chance the Gambler asked Facebook and Twitter for a set of five random numbers between 3-32, with each number corresponding to a selection in the SuperContest. @tylerlauletta facebook beat you y'all are pathetic. Side Note: follow me @tylerlauletta if you’re into that. And there you have it folks! Eat, drink and be merry. Gambling is back. Life is good. I’m already looking forward to seeing you guys again next week.